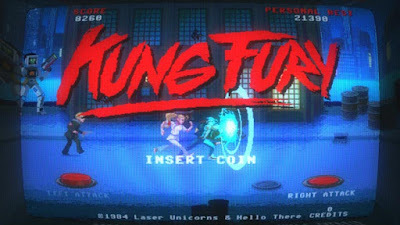 Kung Fury: Street Rage is a video game based off a crowdfunded short-film homage devoted to the nostalgic glory of everything 80's. The game, however, narrowly misses the mark. For all that this game captures the essence of the 80's coin-op arcade machines in both appearance and sound design, it loses all that magic with extremely shallow gameplay. Instead of a real brawler or beat em' up this rightfully should've been, we get a single revolving screen with 2 attack buttons in order to create one giant combo. Attack right or attack left. If you tap it and move without hitting something, or getting hit yourself, will cause you to lose the combo meter. The simplistic mechanics hold the game back from grasping the grandeur of becoming a modern classic- a game worthy of the name it hearkens to- Streets of Rage. Being a free game, it can't be too harshly judged. The visuals and sounds are absolutely stunning. It's just that the game gives you a small taste of something wonderful, and then you find that the first nibble was actually the entire meal. Kung Fury: Street Rage calls back to the brawler and beat em' up genres, and only delves into the beginnings of the game it could've been. It leaves out all the depth it should've contained. As it is, Kung Fury: Street Rage is merely a simple, forgettable fighter. One can only hope this is merely a test run on the way to producing a truly memorable game. All the building blocks are here, just waiting to be put to better use.